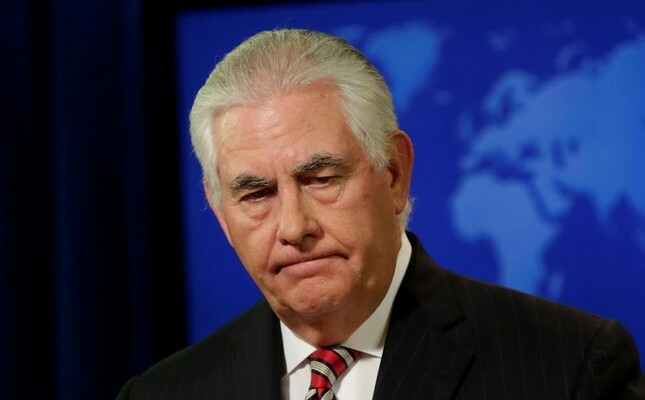 Several congressmen urged U.S. Secretary of State Rex Tillerson in a letter on Tuesday to come up with a plan to "prevent Iran from gaining a permanent foothold" in Syria and voiced concern about Israel's security. The letter came a day after American officials said that U.S. has been arming Iranian-linked militia and anti-Daesh envoy appointed during former U.S. President Barack Obama's tenure, Brett McGurk played a significant role in it. "We are writing to express our concerns regarding Iranian presence in Syria. We recently returned from the region, where we heard concerns from our close ally, Israel, about Iranian operations in Syria," some 43 congressmen said in the letter. "Iran is also directing Hezbollah and other non-Syrian Shiite militia fighters to battle on behalf of the regime," they said. "Hezbollah's 150.000 rockets and missiles is larger than that of most states and could pose a grave military threat to Israel." Saying that Iran should not be allowed to maintain a permanent military presence in Syria, the lawmakers added that it would pose a significant threat to the security of Israel, Jordan, and United States' interests in the region. "A permanent Iranian presence in Syria would connect Lebanon-based Hezbollah to Iran via Iraq and Syria. This would give Iran the ability to project power from the Persian Gulf to the Mediterranean Sea," they added. "Any agreement or policy that allows Iran to station forces on or near Israel and Jordan's border does not serve US interests." "We urge you to come to Congress with a strategy for Syria that includes how the United States plans to prevent Iran from gaining a permanent foothold on Israel and Jordan's doorstep and to block Iranian arms exports to Hezbollah," the lawmakers concluded. U.S. officials have agreed that Iranian-backed militias could be using American-made arms and McGurk had a key role in enabling policies that helped arm the militants, the conservative Washington Free Beacon said in a piece on Monday, citing American officials. "Lawmakers and others have singled out Brett McGurk, the special presidential envoy for the Global Coalition to Counter ISIS, as playing a key role in enabling policies that help arm Iranian backed forces," the website said, using an alternative acronym for the Daesh terrorist group. The militias in Iraq closely linked to Iran's Islamic Revolutionary Guards Corps (IRGC), are being trained and armed by the American government, the website claimed, quoting sources labeling the policy one of the chief failures of the U.S. in the region.